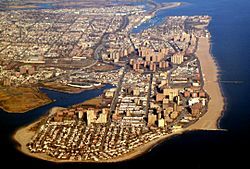 Coney Island is the westernmost part of the barrier islands of Long Island (referred to as the outer barrier islands), and is about 4 miles (6.4 km) long and 0.5 miles (0.80 km) wide lying between Sheepshead Bay to the east and Lower New York Bay to the west. At its highest it is 7 feet (2.1 m) above sea level. It was formerly an island that was separated from the main part of Brooklyn by Coney Island Creek, a partial tidal mudflat, but a large portion of the creek was filled as part of 1920s and 30s land and highway development, turning the island into a peninsula. The perimeter of Coney Island features man made structures designed to maintain its current shape. The beaches are currently not a natural feature with replenishing sand being cut off by the jetty at Breezy Point, Queens. Sand has been redeposited on the beaches via beach nourishment since 1922-1923, the first such project ever, and is held in place by around two-dozen groynes. Sheepshead Bay on the east side is, for the most part, enclosed in bulkheads. The original Native American inhabitants of the region, the Lenape, called this area Narrioch. This name has been attributed the meaning of "land without shadows" or "always in light" describing how its south facing beaches always remained in sunlight. A second meaning attributed to Narrioch is "point" or "corner of land". The Dutch established the colony of Nieuw Amsterdam in that area in the early 17th century. The Native American population in the area dwindled as the Dutch settlement grew and the entire southwest section of what was to become Brooklyn was purchased from a native american elder in 1645 for a gun, a blanket and a kettle. At the time of European settlement the land that makes up the present day Coney Island was divided across several separate islands that, over the years, were changing shape because of the constant redeposit of sand due to tidal and storm forces, as well as the reshaping of the island by local residents. "Nobody lives upon it, but it is used in winter for keeping cattle, horses, oxen, hogs and others, which are able to obtain there sufficient to eat the whole winter, and to shelter themselves from the cold in the thickets. This island is not so cold as Long Island or the Mahatans, or others, like some other islands on the coast, in consequence of their having more sea breeze, and of the saltness of the sea breaking upon the shoals, rocks and reefs, with which the coast is beset." East of Coney was originally a peninsula called Coney Hook but in 1750 a canal (called the "Jamaica Ditch") was dug through the Coney Hook salt-marsh from Brown’s creek east to Hubbard’s creek. This connection to the waterways behind the islands allowed shipping traffic to travel from Jamaica Bay to New York Harbor without having to venture out into the ocean. The canal turned Coney Hook into a detached half mile long island called Pine Island, due to the woods on it. East of Pine was the largest section of island called Gysbert's or Guisbert's Island (also called Johnson Island), containing most of the arable land and extending east through today's Brighton Beach and Manhattan Beach. Each island was separated by an inlet that could only be crossed at low tide. By the end of the 1700s the ongoing shifting of sand along the barrier islands had closed up the inlets to the point that residents began filling them in, eventually joining all the islands into the single present day Coney Island. Development of the island was slow over the period of the Dutch occupation up through the early 1800s due to land disputes and the intervening Revolutionary War and War of 1812. By the early 1800s there were only a scattered handful of farms across the entire island. There is no clear historical consensus on how the island got the name "Coney Island", a name, in the form of Conyne Eylandt, that shows up in early 17th century Dutch maps. The most popular theory is the name came from the old spelling of the Dutch word for rabbit, "conyn", derived from a purported large population of wild rabbits, giving it the name "Rabbit Island", The following part of the theory is that the name was anglicized to "Coney Island" after the English took over the colony in 1664, "coney" being the English version of the word rabbit. Alternative theories are that it was named after a native american tribe, the Konoh, who supposedly once inhabited it, that Conyn was the surname of a family of Dutch settlers who lived there, or that "Conyne" was a distortion of the name of Henry Hudson's second mate on the Halve Maen, John Colman, who was slain by natives on the 1609 expedition and buried at a place they named Colman's Point, possibly coinciding with Coney Island. Development on Coney Island has always been controversial. When the first structures were built around the 1830s, there was an outcry to prevent any development on the island and preserve it as a natural park. Starting in the early 1900s, the City of New York made efforts to condemn all buildings and piers built south of Surf Avenue. It was an effort to reclaim the beach which by then had almost completely been built over with bath houses, clam bars, amusements, and other structures. The local amusement community opposed the city. Eventually a settlement was reached where the beach did not begin until 1,000 feet (300 m) south of Surf Avenue, the territory marked by a city-owned boardwalk, while the city would demolish any structures that had been built over public streets, to reclaim beach access. 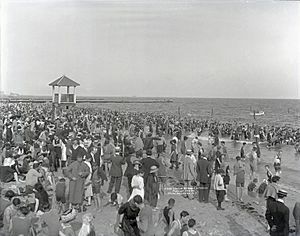 Coney Island started to become a resort area after 1829 when the Gravesend and Coney Island Road and Bridge Company built the first bridge across Coney Island Creek, connecting the island with the mainland, and built Shell Road across the island to the beaches. That same year they also built the first hotel on the island called Coney Island House, near present day Sea Gate. Due to Coney Island's proximity to Manhattan and other boroughs, and its simultaneous relative distance from the city of Brooklyn to provide the illusion of a proper vacation, it began attracting vacationers in the 1830s and 1840s, assisted by carriage roads and steamship service that reduced travel time from a formerly half-day journey to two hours. Most of the vacationers were wealthy and went by carriage. Inventor Samuel Colt built an observation tower on the peninsula in 1845, but he abandoned the project soon after. In 1847, the middle class started going to Coney Island upon the introduction of a ferry line to Norton's Point—named after hotel owner Michael Norton—at the western portion of the peninsula. Gang activity started as well, with one 1870s writer noting that going to Coney Island could result in losing money and even lives. In 1868, William A. Engeman built a resort in the area. 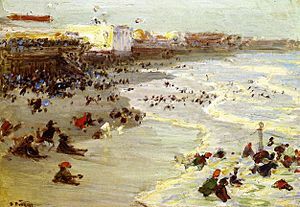 The resort was given the name "Brighton Beach" in 1878 by Henry C. Murphy and a group of businessmen, who chose to name as an allusion to the English resort city of Brighton. With the help of Gravesend's surveyor William Stillwell, Engeman acquired all 39 lots for $20,000, a "bargain price." This 460-by-210-foot (140 by 64 m) hotel, with rooms for up to 5,000 people nightly and meals for up to 20,000 people daily, was close to the then-rundown western Coney Island, so it was mostly the upper middle class that went to this hotel. The 400-foot (120 m), double-decker Brighton Beach Pavilion was also built nearby. 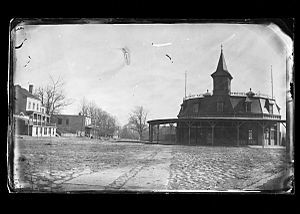 "Hotel Brighton" (or Brighton Beach Hotel) was situated on the beach at what is now the foot of Coney Island Avenue, and was accessed by the Brooklyn, Flatbush, and Coney Island Railway (the present-day BMT Brighton Line), which opened on July 2, 1878. Simultaneously, wealthy banker August Corbin was developing adjacent Manhattan Beach after being interested in the area during a trip to the beach to heal his sick son. Corbin, who worked on Wall Street and had many railroad investments, built the New York and Manhattan Beach Railway for his two luxury shoreline hotels. These hotels were used by the wealthy upper class, who would not go to Brighton Beach because of its proximity to Coney Island. The J. Pickering Putnam-designed, 150-room Manhattan Beach Hotel, with restaurants, ballrooms, and shops, was open for business by 1877 at a ceremony presided over by Ulysses S. Grant. In 1880, the similarly prodigal Oriental Hotel, which hosted rooms for wealthy families staying for extended periods, opened. Andrew R. Culver, president of the Prospect Park and Coney Island Railroad (the present-day IND Culver Line) had built a steam railway to West Brighton, the Culver Line, before Corbin and Engeman had even built their railroads. For 35 cents, one could ride the Prospect Park & Coney Island Railroad to the Surf Avenue terminal. Across the street from the terminal, the 300-foot (91 m) Iron Tower, bought from the 1876 Philadelphia Exposition, provided patrons with a bird's-eye view of the coast. The nearby "Camera Obscura" similarly used mirrors and lens to provide a panoramic view of the area. Coney Island became a major resort destination after the Civil War as excursion railroads and the Coney Island & Brooklyn Railroad streetcar line reached the area in the 1860s, and the Iron steamboat company in 1881. The 150-suite Cable Hotel was built nearby in 1875. Next to it, on a 12-acre (4.9 ha) piece of land leased by James Voorhies, maitre d' Paul Bauer built the western peninsula's largest hotel, which opened in 1876. By the turn of the century, Victorian hotels, private bathhouses, and vaudeville theaters were a common sight on Coney island. From the 1870s through the first decade of the 1900s, these three resort areas—Brighton Beach, Manhattan Beach and West Brighton—competed with each other for clientele, with West Brighton gradually becoming the most popular destination by the early 1900s. Between about 1880 and World War II, Coney Island was the largest amusement area in the United States, attracting several million visitors per year. 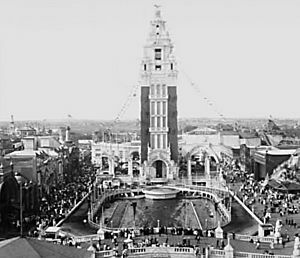 At its height, it contained three competing major amusement parks, Luna Park, Dreamland, and Steeplechase Park, as well as many independent amusements. The area was also the center of new technological events, with electric lights, roller coasters, and baby incubators among the innovations at Coney Island in the 1900s. 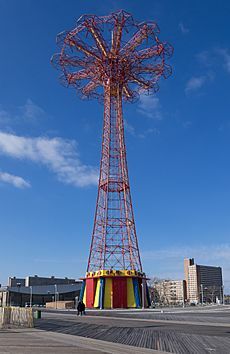 This continued through the end of World War II, with world's fair-style structures such as the Parachute Jump and Wonder Wheel. 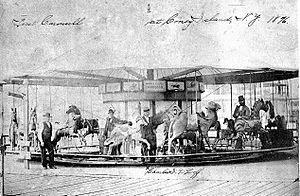 Charles I. D. Looff, a Danish woodcarver, built the first carousel and amusement ride at Coney Island in 1876. It was installed at Vandeveer's bath-house complex at West 6th Street and Surf Avenue. The complex was later called Balmer's Pavilion. The carousel consisted of hand-carved horses and animals standing two abreast. Two musicians, a drummer and a flute player, provided the music. A metal ring-arm hung on a pole outside the ride, feeding small, iron rings for eager riders to grab. A tent-top protected the riders from the weather. The fare was five cents. From 1885 to 1896, the Elephantine Colossus, a seven story building in the shape of an elephant, was the first sight to greet immigrants arriving in New York, who would see it before they saw the Statue of Liberty. The Coney Island "Funny Face" logo, which is still extant, dates 100 years to the early days of George C. Tilyou's Steeplechase Park. When the Brooklyn Rapid Transit Company electrified the steam railroads and connected Brooklyn to Manhattan via the Brooklyn Bridge at the beginning of the 20th century, Coney Island turned rapidly from a resort to an accessible location for day-trippers seeking to escape the summer heat in New York City's tenements. In 1915, the Sea Beach Line was upgraded to a subway line, followed by the other former excursion roads, and the opening of the New West End Terminal in 1919 ushered in Coney Island's busiest era. Since the 1920s, all property north of the boardwalk and south of Surf Avenue was zoned for amusement and recreational use only, with some large lots of property north of Surf also zoned for amusements only. Through the turn of the 20th century Coney Island was still an island, being separated from the main part of Brooklyn by the 3 mile long Coney Island Creek. There were plans for several decades in the 19th century and early 20th century to dredge and straighten the creek as a ship canal, but they were abandoned. By 1924 local land owners had filled a portion of the creek and a major section of the creek was further filled in to allow construction of the Belt Parkway in the 1930s. More fill was added in 1962 with the construction of the Verrazano–Narrows Bridge. The western and eastern ends of the island became a peninsulas. In 1944, Luna Park was damaged by fire, and sold to a company who announced they were going to tear down what was left of Luna Park and build apartments. 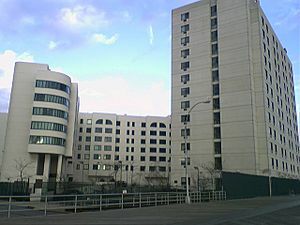 Robert Moses had the land rezoned for residential use with the proviso that the apartment complex include low-income housing. After World War II, contraction began seriously from a series of pressures. Air conditioning in movie theaters and then in homes, along with the advent of automobiles, which provided access to the less crowded and more appealing Long Island state parks, especially Jones Beach, lessened the attractions of Coney's beaches. Luna Park closed in 1946 after a series of fires and the street gang problems of the 1950s spilled into Coney Island. The presence of threatening youths did not impact the beachgoing but discouraged visitors to the rides and concessions, staples of the Coney Island economy. The local economy was particularly impacted by the 1964 closing of Steeplechase Park. In 1949, Moses moved the boardwalk back from the beach several yards, demolishing many structures, including the city's municipal bath house. He would later demolish several blocks of amusements to clear land for both the New York Aquarium and the Abe Stark Rink. Critics complained that Moses took three times more land than each structure needed, surrounding each with vacant lots that were of no use to the city. Four years later, Moses had the entire peninsula rezoned for residential use only and announced plans to demolish the amusements to make room for public housing. After many public complaints, the Estimate Board reinstated the area between West 22nd Street and The Cyclone as amusement only and threw in 100 feet (30 m) of property north of Surf Av. between these streets. It has since then been protected for amusement use only, which has led to many public land battles. In 1964, Coney Island's last remaining large theme park, Steeplechase Park, closed. The rides were auctioned off, and the property was sold to developer Fred Trump, the father of Donald Trump. Trump, convinced that the amusement area would die off once the large theme parks were gone, wanted to build luxury apartments on the old Steeplechase property. He spent ten years battling in court to get the property rezoned. At one point Trump organized a funeral for amusement parks in Coney Island. Trump invited the press to the funeral where bikini-clad girls first handed out hot dogs, then handed out stones which Fred invited all to cast through the stained-glass windows of the pavilion. Then, pronouncing the amusement park dead, he had the pavilion bulldozed. After a decade of court battles, Trump exhausted all his legal options and the property was still zoned only for amusements. 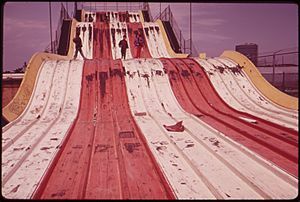 He eventually leased the property to Norman Kaufman, who ran a small collection of fairground amusements on a corner of the site, calling his amusement park "Steeplechase Park". Between the loss of both Luna Park and the original Steeplechase Park, as well as an urban-renewal plan that took place in the surrounding neighborhood where middle class houses were replaced with housing projects, fewer people visited Coney Island. With attendance dropping, many amusement owners abandoned their properties. In the late 1970s, the city came up with a plan to revitalize Coney Island by bringing in gambling casinos, as had been done in Atlantic City. The city's plans backfired when the prospect of selling property to rich casino owners created a land boom where property was bought up and the rides cleared in preparation of reselling to developers. Gambling was never legalized for Coney, and the area ended up with vacant lots. By the 1970s, the area was in dispute. The city was considering demolishing the Cyclone in favor of an extension of the adjacent New York Aquarium. In 1979, the city purchased Steeplechase Park from Fred Trump and proceeded to evict Norman Kaufman's amusements. By this time, Kaufman had expanded his park and had plans to eventually rebuild the historic Steeplechase Park. He had even bought back the original Steeplechase horse ride with plans to install it the following season. But the city decided it did not want to wait decades for Steeplechase park to be rebuilt and believed it could attract a developer to build a large combination theme park and casino on the site. The property remained vacant for another five years. In the mid-1980s, businessman Horace Bullard approached the city to allow him to rebuild Steeplechase Park. He had already bought several acres of property just east of the Steeplechase Park site, including the property with a large coaster called Thunderbolt and property west of Abe Stark rink. His plans called for the combination of his property as well as the Steeplechase property and the unused property on the Abe Stark site as a multimillion-dollar theme park based on the original. The city agreed, and it and the state legislature approved the project in 1986. However, several bureaucrats held up the project for another two years while the NYC Planning Commission compiled an environmental impact report. In 1987, state senator Thomas Bartosiewics attempted to block Bullard from building on the Steeplechase site. Bartosiewics was part of a group called The Brooklyn Sports Foundation which had promised another theme park developer, Sportsplex, the right to build on the site. Construction was held up for another four years as Bullard and Sportsplex fought over the site. In 1994, after Rudy Giuliani took office as mayor of New York, he negated the Bullard deal by building a baseball stadium on the site allotted for Steeplechase Park. Giuliani stated that he wanted to build Sportsplex, provided that it included a stadium for a minor-league team owned by the Mets; however, when Giuliani ordered the stadium to be built first, Sportsplex accused the city of planning to build a parking lot on the property earmarked for the Sportsplex construction. Giuliani publicly denied this and promised Sportsplex could begin construction the moment the stadium was finished. By doing this, Giuliani wanted to improve sports facilities in the area, as well as found a professional baseball team in Brooklyn (which had not hosted such a team since 1957, when the Brooklyn Dodgers—now the Los Angeles Dodgers—moved to Los Angeles). As soon as the stadium was completed, Giuliani nullified the Sportsplex deal and had the parking lot built, angering many in the community. The Mets decided the minor league team would be called the Brooklyn Cyclones and sold the naming rights to the stadium to Keyspan Energy. Executives from Keyspan complained that the stadium's line of view from the rest of Coney Island amusement area was blocked by the now derelict Thunderbolt coaster and considered not going through with the deal. 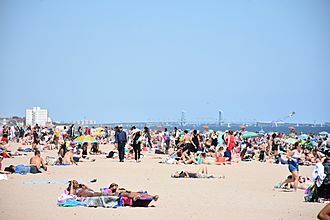 In 2003, Mayor Michael Bloomberg took an interest in revitalizing Coney Island as a possible site for the New York City bid of the 2012 Summer Olympics. A plan was developed by the Astella Development Corporation. When the city lost the bid for the Olympics, revitalization plans were passed on to the Coney Island Development Corporation (CIDC), which came up with a plan to restore the resort. Many amusement owners worried that because one of the report's goals to develop the area as a year-round destination, they could be forced out as their businesses are only seasonal and did not meet the CIDC's year-round goal. The CIDC also suggested that property north of Surf Avenue and west of Abe Stark should be rezoned for other uses including residential to lure developers into the area. Thor then went about using much of its $77 million profit to purchase property well over market value lining Stillwell Avenue and offered to buy out every piece of property inside the traditional amusement area. Quickly, rumors started that Thor was interested in building a retail mall in the heart of the amusement area. In September 2005, Thor's founder, Joe Sitt, went public with his new plans, a large Bellagio-style hotel resort surrounded by rides and amusements. Sitt released renderings of a hotel that would take up the entire amusement area from the Aquarium to beyond Keyspan Park. Astroland owner Carol Hill Albert, whose husband's family had owned the park since 1962, sold the site to developer Thor Equities in November 2006 for an undisclosed amount. In January 2007, Thor released renderings for a new amusement park to be built on the Astroland site called Coney Island Park. Thor proposed a $1.5 billion renovation and expansion of the Coney Island amusement area to include hotels, shopping, movies, an indoor water park and the city's first new roller coaster since the Cyclone. The Municipal Art Society launched the initiative ImagineConey, in early 2007, as discussion of a rezoning plan that highly favored housing and hotels began circulating from the Department of City Planning. MAS held several public workshops, a call for ideas, and a charrette to garner attention to the issue. Astroland, which had served as a major amusement park since 1962, closed in 2008 and was replaced by a new incarnation of Dreamland in 2009 and of Luna Park in 2010. City Planning certified the rezoning plan in January 2009 to negative responses from all amusement advocates and Coney Island enthusiasts. In 2012 the plan was working through the ULURP process. Thor Equities said it hoped to complete the project by 2011. Thor Equities plan to demolish most of the iconic, early 20th-century buildings along Surf Avenue. In their place, Sitt plans to build cheap, one-story retail, and his recently released rendering clearly shows Burger King and Taco Bell-like buildings. The Aquarium is also planning a renovation. In June 2009, the city's planning commission unanimously approved the construction of 4,500 units of housing and 900 affordable units and vowed to "preserve, in perpetuity, the open amusement area rides that everyone knows and loves," while protesters argued that "20 percent affordable-housing component is unreasonably low." Besides Luna Park, the remaining parks and attractions include Deno's Wonder Wheel Amusement Park, 12th Street Amusements, and Kiddie Park, while the Eldorado Arcade has an indoor bumper car ride. The Zipper and Spider on 12th Street were closed permanently on September 4, 2007, and dismantling began after its owner lost his lease. They are to be reassembled at an amusement park in Honduras. On April 20, 2011, the first new roller coasters to be built at Coney Island in eighty years were opened as part of efforts to reverse the decline of the amusement area. In 2012, Hurricane Sandy caused major damage to the Coney Island amusement parks, the Aquarium, and businesses. 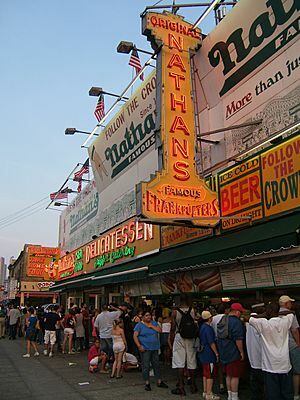 Nathan's, however, reported that the Nathan's Hot Dog Eating Contest would be held the following summer, as usual. Luna Park at Coney Island reopened on March 24, 2013. Rebuilding of the Aquarium started in early 2013 and is expected to finish in 2017. 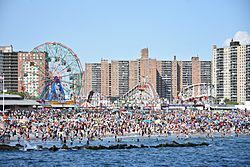 Currently, Coney Island has two amusement parks — Luna Park and Deno's Wonder Wheel Amusement Park — as well as several rides that are not incorporated into either theme park. Coney Island also has several other visitor attractions and hosts renowned events as well. Coney Island's amusement area is one of a few in the United States that is not mostly owned by any one entity. The current amusement park contains various rides, games such as skeeball and ball tossing, and a sideshow, including games of shooting, throwing, and tossing skills. The rides and other amusements at Coney Island are owned and managed by several different companies and operate independently of each other. It is not possible to purchase season tickets to the attractions in the area. 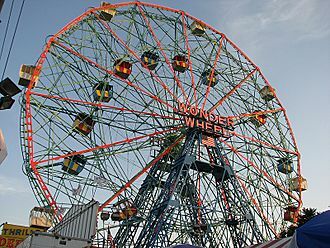 Wonder Wheel – built in 1918 and opened in 1920, this steel Ferris wheel has both stationary cars and rocking cars that slide along a track. It holds 144 riders, stands 150 ft (46 m) tall, and weighs over 200 tons. At night, the Wonder Wheel's steel frame is outlined and illuminated by neon tubes. It is located at Deno's Wonder Wheel Amusement Park. The Cyclone roller coaster – built in 1927, it is one of the United States's oldest wooden coasters still in operation. Popular with roller coaster aficionados, the Cyclone includes an 85 ft (26 m), 60-degree drop. It is owned by the City of New York, and was operated by Astroland, under a franchise agreement. It is now located in and operated by Luna Park. Parachute Jump – originally built as the Life Savers Parachute Jump at the 1939 New York World's Fair, this was the first ride of its kind. Patrons were hoisted 190 ft (58 m) in the air before being allowed to drop using guy-wired parachutes. Although the ride has been closed since 1968, it remains a Coney Island landmark and is sometimes referred to as Brooklyn's Eiffel Tower. Between 2002 and 2004, it was completely dismantled, cleaned, painted, and restored, but remains inactive. After an official lighting ceremony in July 2006, the Parachute Jump was slated to be lit year-round using different color motifs to represent the seasons. However, this idea was scrapped when New York City started conserving electricity in the summer months, and it has not been lit regularly since. Thunderbolt – In March 2014, construction started on the new Thunderbolt coaster at Coney Island. The Thunderbolt will be manufactured by Zamperla at a cost of US$10 million and will have a 90-degree vertical drop, followed by a 100-foot loop and a zero-gravity roll, along with dives, hills and a corkscrew — all within two minutes. The ride will feature 2,000 feet (610 m) of track, a height of 125 feet (38 m), and a top speed of 65 miles per hour (105 km/h). Thunderbolt will feature three inversions including a vertical loop, corkscrew, and an Immelmann loop. The Thunderbolt, will be located near Surf Avenue and West 15th Street in Coney Island will be constructed with 2,233 feet of track that will stretch to a height of 115 feet and will be built next to the B&B Carousell, an antique merry-go-round that underwent an extensive restoration and reopened last summer. The opening of the Thunderbolt, expected to be by Memorial Day 2014, was pushed back to June 6, 2014, and in early June, it was delayed once again to later in summer 2014. Finally, on June 14, the Thunderbolt was opened. B&B Carousell [sic] (as spelled by the frame's builder, William F. Mangels) – this is Coney Island's last traditional carousel, near the old entrance to Luna Park but now surrounded by furniture stores. The carousel is faster than usual, with a traditional roll-operated fairground organ. When the long-term operator died unexpectedly, the carousel was put up for auction, with fears that it would leave Coney Island or be broken up for sale to collectors. However, the City of New York bought the B&B Carousell a few days before the auction; it has since been dismantled, with plans to operate it again in Coney Island in 2013 in a newly constructed carousel pavilion that will be built in Steeplechase Plaza, a 2.2-acre public plaza that is also scheduled to be open for the 2013 season. All the other carousels on Coney Island are kiddie park-style. For the restoration, Theresa Rollison, a painter with Carousels and Carvings, custom-mixed more than 80 colors to replicate the original hues. She then applied salmon pink, lemon yellow, metallic silver and maroon, using natural brushes made from badger, squirrel, and hog bristle. “I wouldn’t have chosen to put some of the colors together, but overall it works,” she said. The final part of the restoration was new horsehair tails for the 50 horses, and with that the New York City Economic Development Corp paid $1,700,000 for the restoration. For decades, Coney Island was something of a carousel headquarters. In the late 1800s, carousel makers set up shops there, and by the turn of the century, two dozen merry-go-rounds were operating on the island. There even evolved a Coney Island school of carousel design, distinct from the more staid Philadelphia and County Fair styles. The Coney Island style was characterized by a flamboyant, aggressive-looking horse — neck straining, nostrils flaring, and tongue lolling. The B&B was built in Coney Island, with a frame dating to 1906, and at some point, it operated in New Jersey, although it is unclear for how long. In the early 1920s it received a new set of horses that were carved by Charles Carmel, one of Coney Island’s celebrated carousel makers. It had returned to Brooklyn by 1935. Bumper cars – there are three separate bumper car rides on Coney Island, located on 12th street, Deno's Wonder Wheel Park, and Eldorado's Arcade on Surf Avenue. Haunted houses – two traditional dark ride haunted houses operate at Coney Island, Spook-a-Rama at Deno's and Ghost Hole on 12th street. 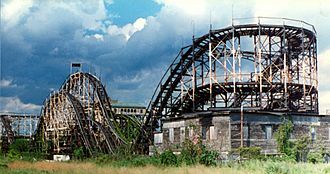 Thunderbolt – this roller coaster across the street from Steeplechase Park was constructed in 1925 and closed in 1983. It was torn down by the city "to protect public safety" in 2000 during the construction of nearby Keyspan Park. In the Woody Allen movie Annie Hall, Allen's character's family lives in the small house-like structure under the rear of the roller coaster track. Tornado – this roller coaster was constructed in 1926. It suffered a series of small fires which made the structure unstable, and was torn down in 1977. Steeplechase Park Horse Race – created by a Coney Island resident George C. Tilyou in 1897, this ride consisted of people riding wooden horses around the park on a steel track. The beach at Coney Island in June 2016, with the Marine Parkway–Gil Hodges Memorial Bridge visible on the horizon. The sand beach at the west end of Coney Island at Sea Gate is private, only accessible to residents. There is a broad public sand beach that starts at Sea Gate at West 37th Street, through the central Coney Island area and Brighton Beach, to the beginning of the community of Manhattan Beach, a distance of approximately 2.5 mi (4.0 km). The beach is continuous and is served for its entire length by the broad Riegelmann Boardwalk. A number of amusements are directly accessible from the land-side of the boardwalk, as is the aquarium and a variety of food shops and arcades. There is a 400m long public beach further down in the community of Manhattan Beach. The public beaches are groomed on a regular basis by the city. Since sand no longer naturally deposits on the beach it is replenished in regular beach nourishment projects using dredged sand. The south facing beach is without significant obstructions and is in sunlight all day. The public beaches are open to all without restriction, and there is no charge for use. The beach area is divided into "bays", areas of beach delineated by rock groynes, which moderate erosion and the force of ocean waves. The Coney Island Polar Bear Club consists of a group of people who swim at Coney Island throughout the winter months, most notably on New Year's Day, when additional participants join them to swim in the frigid waters. The beach serves as the training grounds for the Coney Island Brighton Beach Open Water Swimmers (CIBBOWS), a group dedicated to promoting open water swimming for individuals of all levels. CIBBOWS hosts several open water swim races each year, such as Grimaldo's Mile and the New York Aquarium 5k, as well as regular weekend training swims. Nearby, the New York Aquarium, which opened in 1957 on the former site of the Dreamland amusement park, is another attraction on Coney Island. In 2001, KeySpan Park opened on the former site of Steeplechase Park to host the Brooklyn Cyclones minor league baseball team. In May 2015, Thor Equities unveiled Coney Art Walls, a public art wall project curated by former director of the Museum of Contemporary Art (MOCA) Jeffrey Deitch and Thor CEO Joseph Sitt. Located at 3050 Stillwell Avenue, the project featured more than 30 world renowned artists including legends such as Lady Pink, Crash, Daze, Futura and Kenny Scharf, as well as leading artists of thenext generation including Shepard Fairey, Maya Hayuk and How & Nosm. Coney Art Walls returned in 2016 with 21 new murals, including several of the leading paintings and sculptors in New York, in addition to leading artists connected with street culture. The Coney Island Mermaid Parade takes place on Surf Avenue and the boardwalk, and features floats and various acts. It has been produced annually by Coney Island USA, a non-profit arts organization established in 1979, dedicated to preserving the dignity of American popular culture. Coney Island USA has also sponsored the Coney Island Film Festival every October since 2000, as well as Burlesque At The Beach, and Creepshow at the Freakshow (an interactive Halloween-themed event). It also houses the Coney Island Museum. 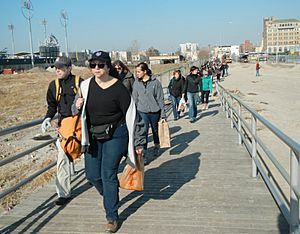 The annual Cosme 5K Charity Run/Walk, supported by the Coney Island Sports Foundation (CISF), takes place on the last Sunday of June on the Riegelmann Boardwalk. In August 2006, Coney Island hosted a major national volleyball tournament sponsored by the Association of Volleyball Professionals. The tournament, usually held on the west coast of the United States, was televised live on NBC. The league built a 4,000-seat stadium and twelve outer courts next to the boardwalk for the event. The tournament returned to Coney Island in 2007 and 2008. In April 2009, Feld Entertainment, parent company to Ringling Bros. and Barnum & Bailey Circus, announced that "The Greatest Show on Earth" would perform on Coney Island for the entire summer of 2009, the first time since July 16, 1956 that Ringling Bros. had performed in this location. The tents were located between the boardwalk and Surf Avenue, and the show was called The Coney Island Boom-A-Ring. In 2010, they returned to the same location with The Coney Island Illuscination. At the 2000 census, there were 51,205 people living in Coney Island. Of those people, 51.2% were White, 29.3% were Black, 18% were Hispanic or Latino, 3.8% were Asian, 0.5% were Native American, 0.1% were Pacific Islander, 7.6% were some other race, and 3.7% described themselves as two or more races. 70.5% had a high school diploma or higher, and 20.7% had a bachelor's degree or higher. The median household income in 1999 was $21,281. The neighborhoods on Coney Island, from west to east, are Sea Gate, Coney Island proper, Brighton Beach, and Manhattan Beach. Sea Gate is a private community, one of only a handful of neighborhoods in New York City where the streets are co-owned by the residents and the city. Sea Gate residents pay both, city and Sea Gate taxes. Sea Gate and the Breezy Point Cooperative are the only city neighborhoods cordoned off by a fence and gate houses. 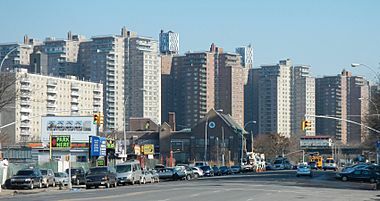 The majority of Coney Island's population resides in approximately thirty 18- to 24-story towers, mostly various forms of public housing. In between the towers are many blocks that were filled with vacant and burned out buildings. Since the 1990s there has been steady revitalization of the area. Many townhouses were built on empty lots, popular franchises opened, and Keyspan Park was built to serve as the home for the Brooklyn Cyclones baseball team. Once home to many Jewish residents, Coney Island's main population groups today are African American, Hispanic, and recent Russian immigrants. Coney Island's main subway stop is Coney Island – Stillwell Avenue and is served by the Template:NYCS Stillwell trains. The terminal is the largest elevated metro station in North America and one of the largest elevated metro stations in the world, with eight tracks serving four platforms in the station. The entire station was rebuilt in 2002–2004. The bus terminal beneath the station serves the B68 to Prospect Park, the B74 to the Coney Island/Sea Gate border, the B64 to Bay Ridge, and the B82 to Starrett City. The B36 runs from the Sea Gate border at West 37th Street to Nostrand Avenue at Avenue U in Sheepshead Bay, Brooklyn. The X28 provides express bus service to Manhattan on weekdays. 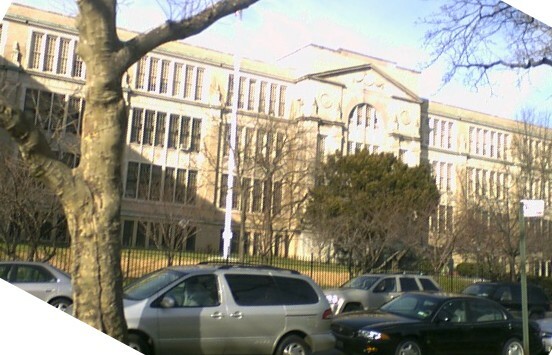 The three main west-east arteries in the Coney Island community, are, from north to south, Neptune Avenue (which crosses travels through Brighton Beach before becoming Emmons Avenue at Sheepshead Bay), Mermaid Avenue, and Surf Avenue (which becomes Ocean Parkway and then runs north toward Prospect Park). The cross streets in the Coney Island neighborhood proper are numbered with "West" prepended to their numbers, running from West 1st Street to West 37th Street at the border of Sea Gate (except for Cropsey Avenue, which becomes West 17th Street south of Neptune Avenue). The Ocean Parkway bicycle path, the oldest designated bicycle path in the United States, terminates in Coney Island. The Shore Parkway bikeway runs east along Jamaica Bay, and west and north along New York Harbor. Street bike lanes are marked in Neptune Avenue and other streets in Coney Island. Coney Island is expected to be served by the Citywide Ferry Service at a date not yet determined. 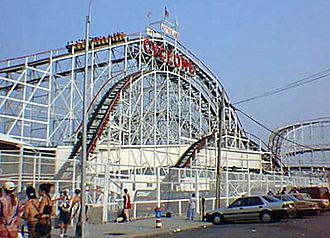 Coney Island has been featured in many films, television shows, cartoons, and theatrical plays. Coney Island Facts for Kids. Kiddle Encyclopedia.